Dark-backed Weaver, Range-change map between SABAP1 (1987-1991) and SABAP2 (2007-current). 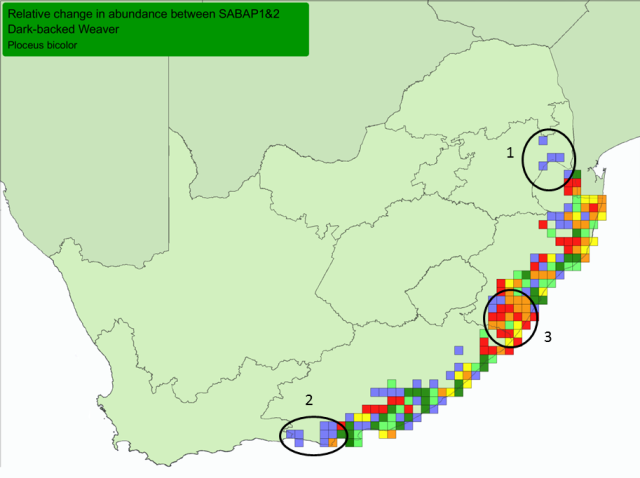 In South Africa the Dark-backed Weaver has more grid cells with increases in reporting rate than cells showing decreases, between SABAP1 (1987-1991) and SABAP2 (2007-), although this is reversed when using 30 checklists for the analysis. The Dark-backed Weaver is still regular in many areas but habitat loss and fragmentation of natural forest may affect the overall population of this species. The points below match the points on the map above. 3. low reporting rate and shows decreases in southern KwaZulul-Natal. Uganda: 3 seen, first record at Mt Elgon for 100 years (Demey 2011b). Zimbabwe: range expansion upstream along Zambesi River (Rushforth 2003a). Zimbabwe: range expansion - Lake Manyame, Harare (Baker 2009a).